I know it may be odd to talk about “spoilers” when this is the story of a mythological character, but there are reasons for that and I will explain in the review. This book is told from the point of view of Circe, daughter of the sun Titan Helios. Her mother was Perse, a sea nymph who was the granddaughter of the Titan Oceanos. We mainly know of Circe from the Odyssey and her interactions with Odysseus. She was known as a sorceress who lived on an island and turned men into pigs. We know from the Odyssey that Circe was often seen working at a huge loom surrounded by dangerous animals such as wolves and lions, yet they were all under her control. We also know from the Odyssey that Odysseus – by virtue of his wiles – not only avoids Circe’s sorcery but beds her as well. When he leaves she gives him advice on how to survive the perils on his seaward journey home to his homeland of Ithaca, such as Scylla and Charybdis, so he can reunite with his beloved wife Penelope and son Telemachus. So why did I like this book so much? Well, stand back, because I’m about to gush. I am a big fan of Greek mythology, and I was a big fan of this author’s previous book, The Song of Achilles. Yet this one was even better. Circe was not a major figure in the Odyssey; in fact when I first opened the book I realized I got her mixed up with Calypso. But I won’t make that mistake anymore. This minor character has now become my favorite character of all thanks to this author’s brilliant work. Because this book is told from Circe’s point of view, we get to intimately know her – not just her history and story but her thoughts as well. The reason this is so important is because we come to empathize with Circe. We tend to think of the Greek Gods as so fickle and often cruel – and indeed they are often depicted that way – yet with Circe, we meet a goddess who is so human and so very, very likable. 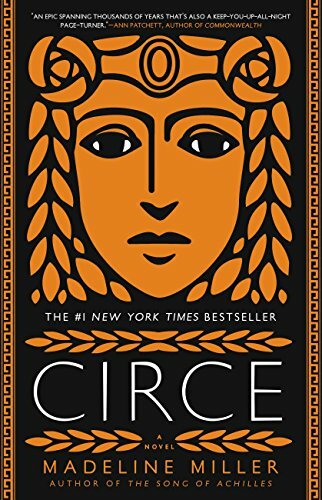 The reason I made the “no spoilers” comment at the start, is because Circe’s experiences include her meeting and interacting with various other figures from Greek myth, and it’s a big part of the enjoyment of this novel to experience it the way the author intended, without knowing what is going to happen next. I took a few days to read this book but that was not because it was a slow read. Just the opposite; I was so happy while reading it that I would stop myself after each chapter just to pace myself so it wouldn’t end too soon. I highly (obviously) recommend this to any fans of Greek mythology and for sure to anyone who enjoyed The Song of Achilles. But you don’t have to know much about the Odyssey or Greek mythology to love this book. Although this novel is about a god, it’s really a story about what it means to be human. I’ve been waiting for Circe since I closed the endpapers of The Song of Achilles. Miller has the expert’s eye and a storyteller’s touch – a female storyteller at that, which makes her remarkable among the other writers and rewriters of the classic Greek tales. Here, her gifts are used in telling the story of Circe, child of Helios and one of the lesser gods, the first witch of the world. She spins a tale of bravery, gullibility, fear and courage; she tells the tale of a goddess who has the heart of a mortal. I don’t want to give anything away and thus ruin Miller’s spellbinding tales, but it’s not a spoiler to say that I was astounded by the ways in which Miller was able to imbue her heroine with the same human frailties and fears as those of us mere mortals: the love of a mother, the burning shame of disgrace, the slow and fast at once finding of ones identity and center, the ways in which we all reach for more than perhaps we know, the giddy ness of losing ones fear and with it, the donning of grace and gratitude. Circe’s tales are big, and they’re writ large here. And yet they feel so real and common even as they burn with a strange fire. Miller deserves to be mentioned among the greats. I look forward to her next creation with excitement and of course more than a little adoration. Give yourself the beautiful opportunity to see Circe as she has never been seen. Read this book right away!! A Classic Tale Reimagined – Taking a classic story and reinventing it with a modern twist is nothing new. We see it time after time, but the usual reimagining places the characters and plot in a contemporary setting as the story plays out. With Circe, Madeline Miller kept the characters and the setting, and instead shifted the focus, placing it solely on Circe. Those of you with a background in mythology will see many, many elements from classic Greek mythology (especially The Odyssey) popping up in this book. However, if you’ve lived under a rock and never even knew there was such a thing as mythology it won’t matter. Miller gives you everything you need to know and she does it seamlessly. A Woman with Attitude – If you’re anything like me, you will come to adore Circe, the book and the woman. Born into one of the two most powerful families of gods, Circe adored her father, Helios, but never quite measured up. Where her siblings were gorgeous and powerful from an early age, Circe was plain and seemingly powerless. Tormented by her own family, Circe grew more and more fascinated with mortals. Falling in love with one, brought out her previously unknown powers of witchcraft. This girl had gumption and she used her new power to punish her rival, creating a monster all came to feared. But, she paid a price for going too far. Circe was banished to the small island of Aiaia for eternity. This is where the book Circe really took off for me. On the island, I found it impossible not to admire and root for this woman who year after year, century after century, faced her fears, honed her powers, and learned to stand up for herself. Soap Opera of the Gods – You might think a story of a woman alone on an island could get dull, but you would be wrong. Circe lived a lonely life, but was not without the occasional visitor, many bringing adventure and challenges to her life. Hermes flitted in and out with news and gossip from the worlds of gods and mortals. Her sister, Pasiphae, granted Circe temporary exile to help deal with her little Minotaur problem. Shipwrecked sailors soon discovered the wrath of Circe. And then came Odysseus, perhaps her most well known visitor, bringing to Circe a lasting love she was willing to die for. The level of drama never failed! That House – I really can’t say any more, but for those who have read Circe: I want that house! Absolutely EVERYTHING worked for me in Circe!